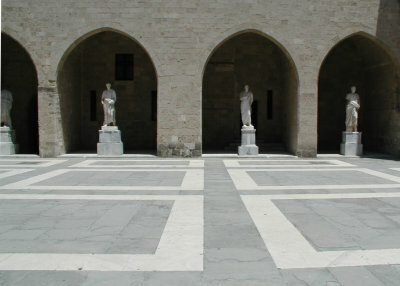 Adam J Purcell logs his travels to the Greek Island of Rhodes in June 2004. Adam J Purcell logs his travels to the Greek Island of Rhodes in June 2004.Never fly charter. Only take night flights if you're going Business or First. These are the words of wisdom I ignored going to Rhodes. I urge you not to make the same mistake. So started the journey and the Sunday that never happened. Taxi pickup on the Saturday at 20:30, at Gatwick for about 20:45. Queue up with a couple of hundred bargain basement holidaymakers at the check-in for about half an hour. 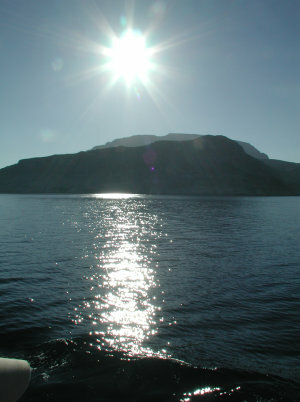 So the night continued until about 00:45 when we finally left the runway for the sunny Greek Island. The worst aspect of cattle-class is not the lack of leg room, per se (I'm not exactly tall), nor even the type of person you have to share the cabin with but rather the inability to make you seat go back any meaningful amount. There's not even a leg section that goes up as the back of you chair goes back those couple of inches. In short, it is impossible to get even a hint towards laying down without vacating your seat and using the aisle instead! For some reason the cabin staff don't seem to like that idea too much... Anyway, the lack of being able to lay down (and hence not being able to reduce your blood pressure too much) and not even be able to get comfortable pretty much put the kibosh on any plans for sleep that night. Given we were going east by a couple of time zones also meant that our landing at about 04:30 British Summer Time put us down after dawn at the local time of 06:30. Where did the night go? We all trooped through passport control (whatever happened to that idea of there being no borders in Europe, anyway?) and waited an age for our luggage to catch us up. Then, rather bleary eyed, we were all herded onto a few coaches to be dropped off at various locations around the island. It's always strange getting to an airport in broad daylight, staying in the sleepless airport for a few hours, onto a plane for many more hours and then out of the airport the other side only to be greeted by daylight again. Is it a new day or not? Did the night happen when I wasn't paying attention? It's rather like the disorientation you can sometimes get when you come out of a cinema, only much worse so. This time my body clock was telling me it was about 04:00 in the morning but not only is it light but it has never truly been dark. By this time it may only have been about 07:30 local time but already it was gloriously sunny and surprisingly warm. Thankfully the coach was airconditioned. Looking out of the window Rhodes looked like a very interesting place indeed. Clearly volcanic in origins, seemingly everywhere was nasty jagged looking grey rock with the occasional plant to break up the bleakness of it. There were no patches of grassland, nor any fields, at least on the east side of the island that we traveled down from Rhodes Town at the north to the ancient town of Lindos about 2/3rd the way down the island to the south. It was clearly a very poor community outside of the capital that shares it's name with the island. Outside of the tourist areas you've got to wonder how these people make a living on the mostly barren looking land. It brings to mind a conversation I had with a dutch woman visiting England about a year ago. I forget the context but I do remember being rather amused when she referred to our farmers as peasants. I think it was mainly a translation issue as I'm sure they don't have much in the way of peasants in Holland any more either, but it does serve to highlight a major difference between the UK and Greece, or this Greek Island anyway. These people in their rather unsophisticated homes with their clearly poverty line existence really do, to me at least, conjure up the word peasant. I don't mean that in a flippant or derogatory manner, take away their rusty old mopeds and grubby nike t-shirts and, I suspect, these people are really very little different to how they would have been a few hundred years ago. For the most part they don't appear to have even gotten into the twentieth century yet, let alone the beginnings of the twenty-first. The other thing that really stood out on this hour and a half coach journey (which should only have been about 35 miles if we weren't dropping people off all over the place on the way) was the strange unfinished state of most the homes. There were an awful lot of very ugly building skeletons apparently abandoned part way through construction. Even many of those being lived in had an entire floor left empty and unfinished or, at least, with structural struts still poking through the tops of their flat roofs. I later found out that the roof struts were left in that unfinished and unappealing way quite deliberately - apparently these homes are currently prohibited to have more than two levels (i.e. ground and first floor) but the residents live in hope that this might be relaxed to allow another floor at some time in the future, at which time they can use the struts to fairly easily and cheaply add another storey. Given this epidemic of exposed vertical metal poles jutting out of peoples roofs is so widespread I'm quite surprised none of them have come up with a way to hide them - a parapet, perhaps! As for the seemingly abandoned constructions, apparently the number of visitors who are booked up for Rhodes this year is down 50% on last year. The tour rep suggested this was because of the terrible tabloid headlines about Rhodes, particularly the notorious resort of Faliraki, back last summer. British larger louts and over zealous Police apparently caused many a headline over the 'Silly Season' in the tabloids who have little to report on when Parliament is on school holidays. I can't help but wonder how much was also down to the Euro 2004 effect, i.e. a large number of said scum going off to Portugal to cause trouble and, perhaps, support the English football team. 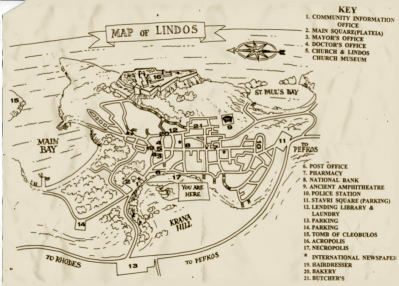 Eventually we arrived at the historic town of Lindos. 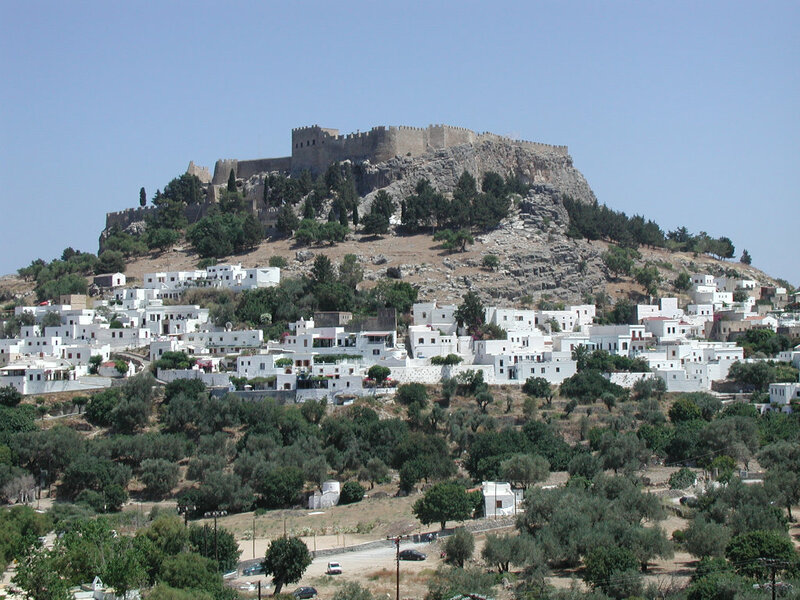 It's a strange place full of narrow winding streets and small whitewashed buildings jammed together as if cowering in the shadow of the acropolis on the hill to the east. In fact the entire town is built in a small valley between the necropolis on the hill to the west and the acropolis apposite it. The streets are far too narrow for cars, even getting blocked up when someone amongst the throng of tourists stops to look at the wares in the doorway of one of the many tourist aimed shops. 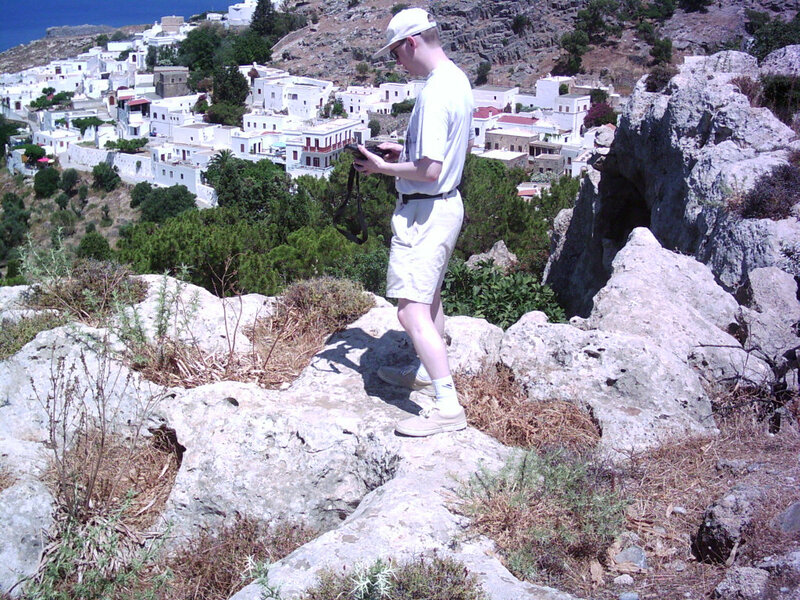 The building regulations in Lindos are very strict, even more so that those isolated looking homes dotted around the rest of island have to endure. All buildings must be whitewashed and keep the historic look of the town. The truth is, though, that there simply is no room to build anything else - these places are literally jammed together, so something would have to be knocked down to make way. I suspect that is highly regulated too. There are no hotels in Lindos, I doubt anything that large would be allowed, no building is larger than a normal home. The only possible exception being a couple of the numerous restaurants that might, just, be as large as two homes knocked into one. Most of the restaurants have installed multi-tiered roof areas to increase their seat capacity and make for a pleasant meal in the cool evening breeze. Navigating the maze like streets was an interesting exercise and I spent quite a lot of the first few days wandering around the town being led by my Global Positioning System receiver. Unfortunately the narrowness of the streets caused a lot a satellite lock-on problems but a brief pause was usually enough to reacquire my location. I'm quite surprised that I didn't see anyone else with a GPS, perhaps most people have a better sense of direction! Lindos itself has given itself over entirely to the tourist trade, tacky gift shops and numerous restaurants line the tiny streets. Around mid-morning to mid-afternoon the place is bustling with coach and boat loads of tourists who stream up to the acropolis and back down to get lost in the town itself. But for these tour groups everybody else is talking English. 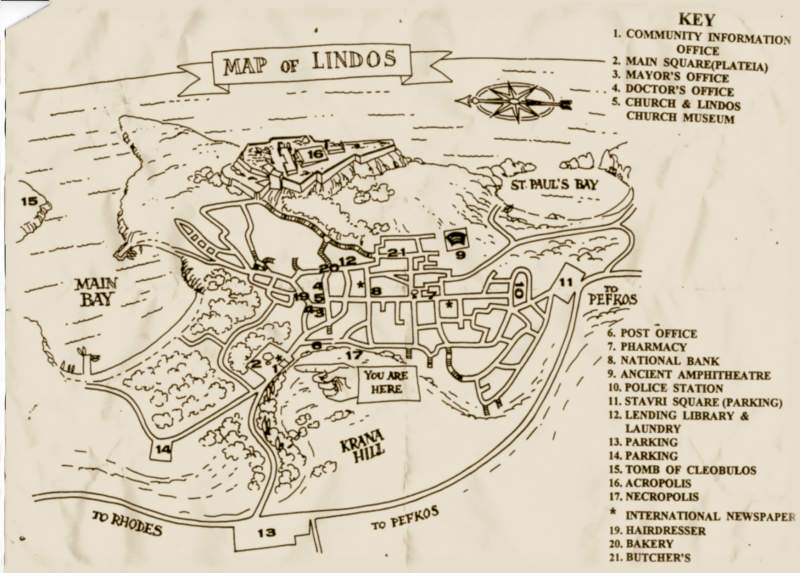 For a few months of the year Lindos becomes a de facto colony of Britain that is visited by the occasional group of German, Italian or American tourists. 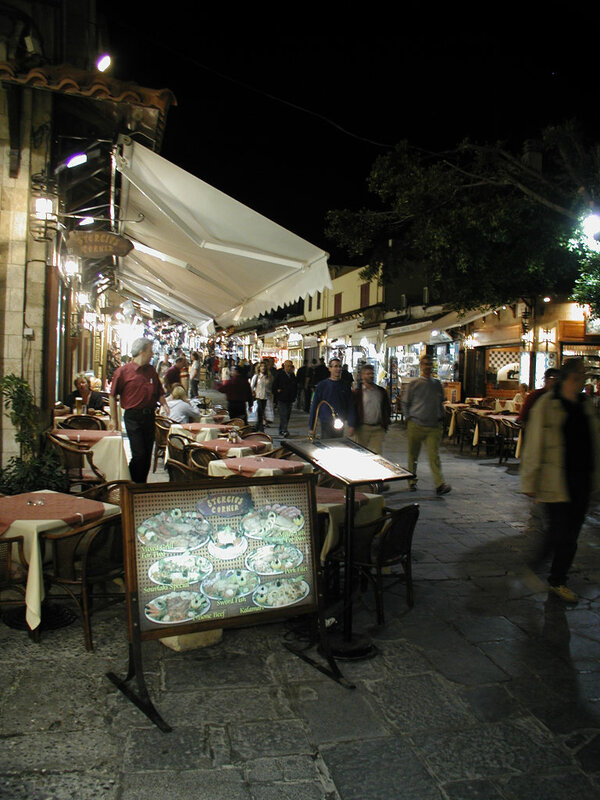 All the natives speak English and all the signs and menus are either exclusively English or have both Greek and English text. Just as well really, as most European countries share the same alphabet so you can usually muddle through with some bad pronunciation followed by wild pointing. I have no idea how to pronounce the various Greek letters, however, so the English translations are even more welcome than they would be in France, Germany, Italy, etc. Like the tour groups I couldn't go to Lindos without visiting its acropolis. Once mid-afternoon arrived the queues of people trekking up the steep rugged hillside in the blazing heat had subsided and it was time to try the journey for myself. 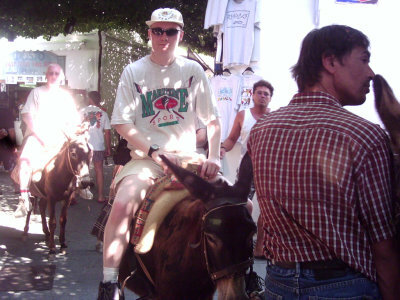 I, however, would get up there by donkey. At 5 € it wasn't a bad deal and it sounded quite fun. The poor donkey I got seemed to be struggling somewhat with my weight, or perhaps it had just been a long day of fat Americans and Germans for it. The donkey master, who had probably underestimated my weight or plain just didn't care, was a little rough on the poor creature hitting it repeatedly as it struggled up the hill, even once hitting it in the face when it looked around. 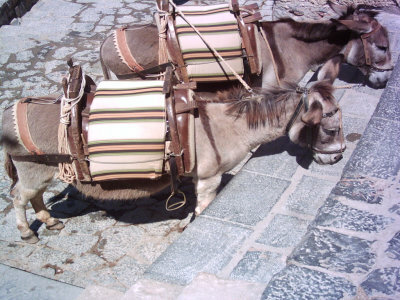 I don't remember ever riding a donkey back home, it was at one time an attraction at many beaches, but I doubt they'd get away with treating them so badly in Britain nowadays. Still, despite that it was a fun little trip, though I think I could have made better time on foot, particularly if I had taken the more direct steps rather than the shallower track around the hill. I don't suppose donkey's are too keen on steep stone steps. A couple of days later I did ascend again, that time on foot via the steps, just to prove to myself it wasn't as difficult as it looked. It wasn't and I needed the exercise after repeated large meals out all week! The acropolis itself is in ruins apart from the exterior walls. I suspect those walls have had some renovation, while I was there they were rebuilding the 'Athena's Temple' section inside the acropolis, using cranes to lift back into place fallen down blocks and reconstructed blocks where the originals had crumbled to uselessness. It was an interesting place, though I could have done with a tour guide. Given this was the very beginning of the holiday season perhaps the tour guides weren't operating yet. Given how crowded Lindos tended to become around midday/early afternoon I dread to think what it would be like in August! For a brit the sea was very inviting - warm, blue and clear rather than the cold murky grey/green we get back home. The Lindos man bay was particularly pleasant given the very gentle incline out into the water, you could walk a good 20 metres out and still only be up to your waist. The only problem with it being the sheer number of those pesky tourists. Again, it was early in the season so not too bad. They were surprisingly well behaved too - I didn't see any sign of the type that brings along their radio to 'share' their loud and unpleasant noise with everyone else. One thing I do regret is not hiring a pedalo - the bay looked a fascinating place to properly explore, especially given the clearness of the water that meant as you walked out you could see fish swimming around your feet. Beach holidays aren't really for me, however. I'd much rather be exploring a place than sleeping idly on a stretch of sand. A few tourists seem to hire cars, a few more still risk their lives on the lethal looking mopeds. The tour guide actually recommended against hiring a moped, not that he needed to warn me off. Apparently accidents are common and not irregularly fatal. He told us how, I think he said last year, a woman and her young daughter, who he was tour guide for, were both killed in such as accident. I don't imagine that was a pleasant week for him. Mopeds are definitely the status symbol for young Rhodians, though. I suspect they don't need a licence, much less any formal training. During a visit to Rhodes Town I must have seen hundreds of the little death traps. Not only did they wind through the road traffic but also through pedestrian traffic too! There were also cases of them trying to squeeze three or more people onto the tiny contraptions, none of them, of course, wearing helmets! I, like most tourists, opted to be driven around rather than drive. By the end of the week I was very fed up of coaches but I was, at least, alive! Two of my three excursions from Lindos had me end up in Rhodes town for a few hours. The so called 'New Town' is a surprisingly modern place full of major shopping chains that you would find back home in Britain, it felt a world removed from the poverty suffered by most of the inhabitants. Not that I went there to visit BHS or any other such place, instead I spent most of my time in the 'Old Town'. If you want tourist shops this must be the world capital! I thought Lindos was bad but it had nothing on Rhodes Old Town - if you want a cheap towel, fake designer perfume or authentic Greek potteryware this really is your place. Fortunately it isn't all about tacky gifts (and a good number of so-so restaurants) as there are a few places of historic interest to explore. The main one is the old Palace of the Grand Master - an impressive castle that was built by the Knights of St. John in the 15th century upon the ruins of an old 7th century Byzantine fortress. 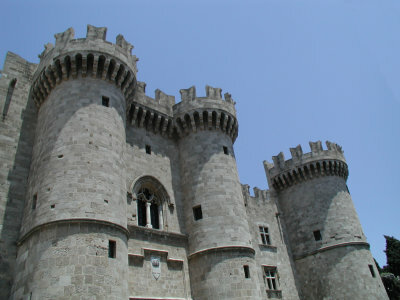 In reality, though, the Knights' castle was all but destroyed in about 1856 during the Turkish occupation of the Island, though rebuilt in the late 1930's. Sadly a lot of damage to the ancient city occurred during this time. It wasn't the first time the historic architecture of the island had been destroyed by an occupying force, however, as the famous Colossus of Rhodes was broken up and sold off to merchants in about 654CE (though it had fallen down some 800 years previously, see the Wikipedia page on the Colossus of Rhodes for more details). 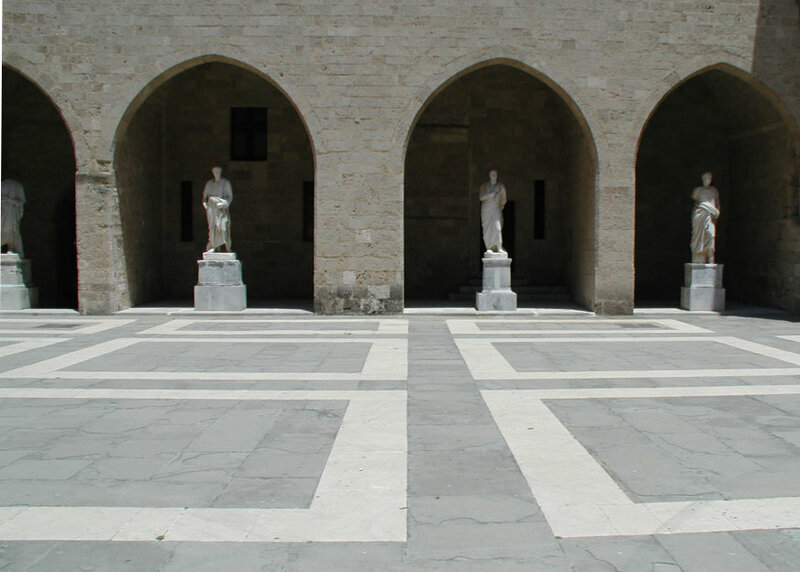 All in all Rhodes, the town and the island, are definitely worth a visit. Fantastically good weather, everyone who has anything to do with visitors speaks at least some English and it's a fascinating mix of cultures and histories. They even have a small Internet Cafe in Lindos! What more could you ask for (besides our usual domestic creature comforts - you'll like it all the more if you enjoy roughing it a little!) 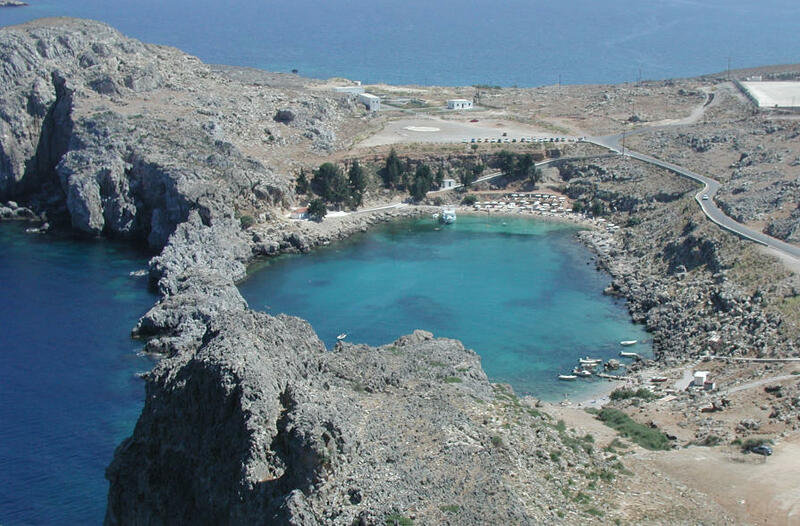 I would advise you avoid the resort areas and instead stay in a little apartment in Lindos. For one thing some of the hotels looked extremely remote and I for one don't like the idea of being fixed to one hotel and its beach for a week. I'm sure as Staggering Stories readers you will agree!